C-141A Starlifter for FSX. Ex payware Alphasim C-141 Starlifter modified to work in FSX. This is the C141A - the B version will not display - must be an old model. This is the nice model created for FS2004 as payware some years ago. Now Alphasim has released this old model as freeware and free to modify. Adapted to work in FSX with panel / VC mods and some other small things. Updated by Danny Garnier. FSX Aero L-29 Delfin package. Tim Conrad's L29 Delfin updated to FSX. Includes an installer, full aircraft, vc and 2d panel, additional textures, and instructions on how to include in EditvoicepackX. Acceleration and Non-Acceleration Compatibility. By Shane Reilly. FS2004/FSX Lockheed F-80 Shooting Star Package. The first operational jet fighter of the USAAF, the Lockheed P-80/F-80 series was essentially a P-51 Mustang with a jet engine. Utilizing the typical wing, fuselage, and empennage of the piston engine era, the F-80's dimensions and armament were nearly identical to the Mustang. However, the performance was far greater once the type came into its own. Several examples were delivered for evaluation prior to war's end, but the initial plans for 5,000 were abandoned after VJ-Day. The type saw service in Korea, and was the basis for the outstanding T-33 trainer. Ex FS9 payware from Alpha Simulations. Works in both FS9 and FSX. Small tweaks for FSX compatibility by Chris Evans. Thank you to the good people at Alpha Simulations for donating this model as freeware. Additionnal views ( defined by camera definitions in the aircraft.cfg file ) for the beautiful Lockheed Martin F-16 Fighting Falcon ( Viper ) by KIRK OLSSON which was upgraded for FSX by BOB CHICILO. A file named F16_Falcon.bmp ( from Eric Marciano's original panel ) which is for the 2D background bitmap and goes in the PANEL directory, can be found in the PANEL directory of the Kirk Olsson's F-16 Thunderbird also upgraded for FSX by Bob Chicilo, These views can be added without modifications to the Thunderbird. See Read me.txt file for very easy installation procedures. Also included is a text file that contains the new camera definitions. Enjoy ! FS2004/FSX Martin B-57B Package. The Martin B-57B was a much-modified version of the original Canberra. The first example flew on June 18, 1954, and featured a drastically-changed crew arrangement and canopy along with a host of other updates. The pilot and navigator sat in tandem, a flat forward windscreen was fitted to make a gunsight installation possible, and speedbrakes were installed in the waist position. Forward-firing guns - machine guns or cannon - were also installed. The B-57B also featured an unusual, rotating-drum type of bomb door that also served as the mounting point for the bombs. This invention saved a great deal of time rearming and also increased the bombing accuracy of the aircraft. The B-57B was in active service with the USAF until 1968, and served on occasion alongside the Canberra B.2. This is the ex payware Alpha Simulations FS9 Canberra B57B released as freeware. Slight mods to make it compatible with both FSX and FS2004 by Chris Evans. Thank you to Alpha Simulations for being big minded enough to release their older models as freeware. FSX Update for the Iris Mig-27 Flogger. This file will enable the FS2004 Iris Mig 27 to be used in FSX. Contains revised panel/VC with XML Russian gauges and thumbnails with textures. Update only. 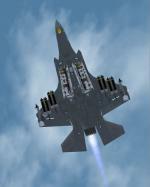 Requires the original superb freeware Iris Mig 27 aircraft for FS2004. Update by Danny Garnier. MiG-25 Foxbat. This is an old Alpha Simulations ex payware model originally for FS2004/2002. Developed to counter the Lockheed A-12, the MiG-25 Foxbat is capable of 1864 mph at optimum altitude. The first prototype first flew in 1964 and series production commenced in 1969. The type is still in service in several of the once Soviet-aligned states. Modified for FSX with XML gauges included in the 2d panel and VC by Danny Garnier. These textures change Dino Cattaneo's F-35A from peacetime to wartime weapons colors. Also added is a texture.cfg so you have more options in employing this partial repaint. Work by Josef of FSXTipline.blogspot.com. FSX North American Rockwell OV-10D Bronco. Modified for FSX by Bob Familton, Shane Reilly, Dietmar Loleit, and David "Opa" Marshall. Originally by Tim Conrad. This is the whole aircraft, with model, updated panel/VC, updated textures, and updated Aircraft.cfg.